Do you do the Crab Walk? For years we’ve all been crab walking with the band around our knees to cue ‘knees out’ and get better glute activation when doing our warm ups. It’s the activation we need for our squats and turnout for dancing however just because our knees are out doesn’t mean our leg is aligned the way we want for good glute activation. Too often we see people leading with their toes rather than keeping hip, knee and ankles aligned but here’s the solution. Pop the band around your feet! The new study by Lewis et al. 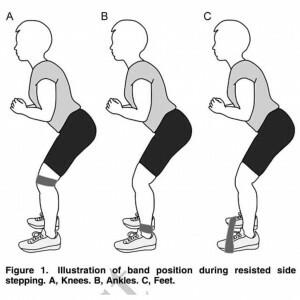 has found that band placement around the feet generates the highest amount of glute activity without increasing TFL activity when compared to band placement around the knees or ankles. So next time you’re crab walking try popping the band around your feet for increased glute activation! Can’t find wide enough shoes for your feet?